I’ve always felt that the swords and sorcery genre (if anyone still calls it that) benefits from a healthy dose of humour. It’s the reason why Army of Darkness, with its tongue planted firmly in cheek, is still entertaining as ever, while I can’t help but feel a tinge of embarrassment whenever I dust off my copy of Krull. 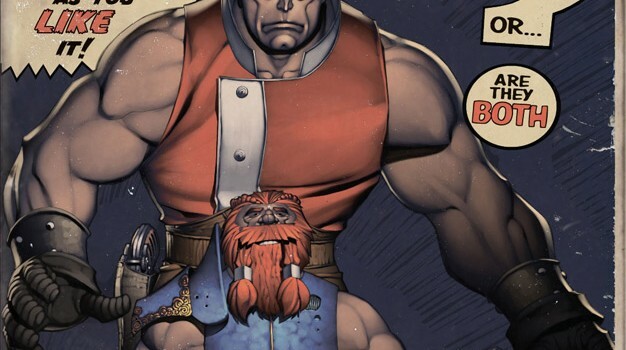 Skullkickers, the new Image series from writer Jim Zubkavich and artist Edwin Huang never takes itself too seriously, if it does at all. And the result is a debut issue that may lack in the storyline department but is still a lot of fun, chiefly due to its seemingly incompatible double team and their perpetual quarrelling. The duo in question is a burly human and a surly dwarf, neither of whom seems to have a name. In any other book that might prove an interference, but Skullkickers hurtles along at such a pace that all you need to know is that these guys are mercenaries, willing to battle werewolves, the undead or any other variety of supernatural beastie in exchange for coin. During a royal parade a chancellor is murdered by a superhuman assassin, and the two are hired to retrieve his body. But instead they uncover something even more sinister going down in the town’s morgue. Edwin Huang’s character designs are attractive and distinctive – the human is a seven foot tall bald brute, the dwarf as burly as they come, and even the werewolf our “heroes” initially battle is comically pot-bellied. The vibrant colours by Misty Coats lend the book an anime sheen that will definitely appeal to any fan of UDON or Blizzard’s art department. Skullkickers certainly has visual panache, and the 80s buddy movie dynamic works very well against the fantasy setting. 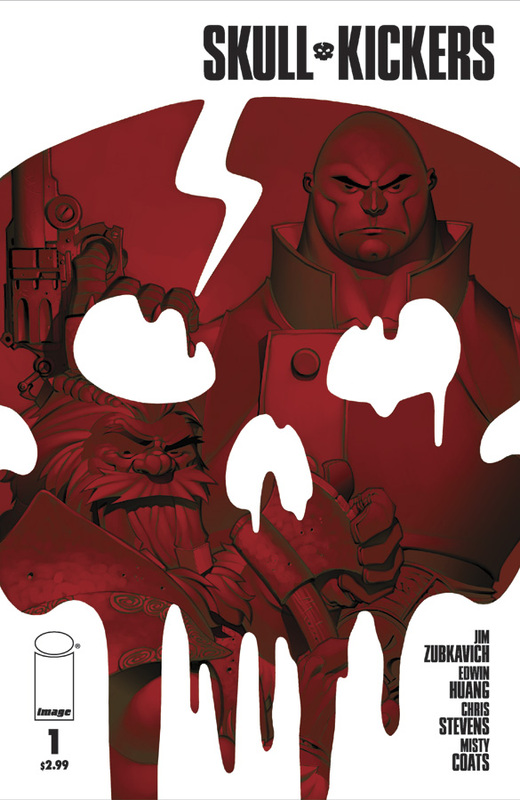 I’d probably be missing the point to criticise the book’s flimsy story, as this series is simply a lot of fun, and hyper-stylised fun at that. But I do feel that Skullkickers currently lacks a decent hook. From this issue alone it isn’t quite clear where the series is heading, and as droll as the banter between baldy/shorty is, the humour isn’t quite sharp enough to carry the book on its own. 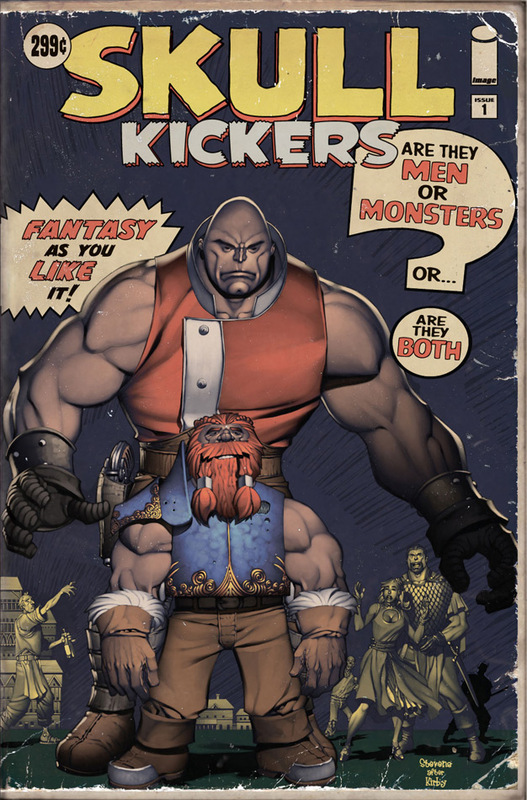 Nevertheless, if you’re looking for a colourful, light-hearted fantasy romp there’s currently nothing out there quite like Skullkickers. For more on Skullkickers, visit www.skullkickers.com.